Johnson's Roman Empire, Imperius Romanorum Latissime Patens. 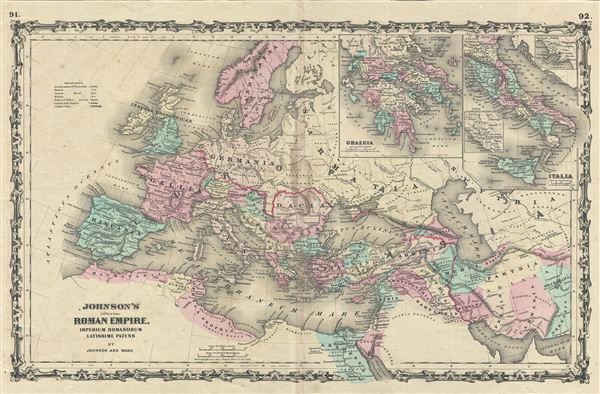 This is an attractive example of Johnson and Ward's 1862 map of the Roman Empire. Covers all of Europe as well as much of the Middle East, Persia and parts of North Africa. Presents the Roman Empire following the Punic Wars, when it reached at its greatest influence. Insets detail Greece and the Italian peninsula. Uses ancient place names. Features the strapwork style border common to Johnsonâ€™s atlas work from 1860 to 1863. Published by Johnson and Ward as plate nos. 91-92 in the scarce 1862 edition of Johnson's Family Atlas. This is the first edition of the Family Atlas to bear the Johnson and Ward imprint. Very good. Some toning and discoloration along original centerfold. Minor spotting at places. Rumsey 2905.055 (1860 edition). Phillips (Atlases) 6140.82-83.